The select 2-year-old in training sales don’t need to set any records in 2012. What would serve the commercial market best would be a steady and continuing rise of 8-12% in average price with buy-back rates hovering in the low- to mid-20% range. Granted the heyday of the early 2000s was pretty exciting, but now we need horses to trade at realistic values and fair profits. The good news for most horsemen this year is they are positioned to do well with only moderate growth. A majority of 2-year-olds are yearling-to-juvenile pinhooks, and the pinhookers have done a good job keeping it real with their yearling purchases. No one would have been surprised had pinhookers stretched their budgets at the 2011 yearling sales, considering the select juvenile sales for the two previous years had generated rates of return around 70%. Optimism was back following the 30% ROR seen in 2009. But the average yearling price for horses entered in the Ocala Breeders’ Sales Co.’s March auction is up only modestly from $57,203 to $59,404. Horses entered in the Fasig-Tipton Florida sale are carrying a significantly lower average yearling cost of $107,558, down from $120,237 for the 2011 sale. That doesn’t mean the Fasig-Tipton auction has less quality, however. Among the horses offered are 55 that sold for $100,000 or more as yearlings and 17 that sold for $200,000 or more. Two-year-old sales are more about athleticism, so a moderately priced yearling in a select sale has already displayed talent. The OBS March sale has 34 horses that sold for $100,000 or more as yearlings. For proof of how modestly priced yearlings can improve, look at the recent Barretts March sale. Two of the top-priced horses were purchased for less than $40,000 as yearlings. Eddie Woods sold a colt by Indygo Shiner for $330,000 that had been purchased for $37,000 at the Fasig-Tipton Kentucky July sale, while SGV Thoroughbreds sold a colt by Broken Vow for $280,000 that had been purchased for $27,000 as a yearling at the OBS August yearling sale. At Barretts the average yearling price of the juveniles offered rose from nearly $33,400 a year ago to around $44,150. Eight horses offered had sold previously for $100,000 or more as yearlings. The results for this group were mixed. Five of them found new homes, and three were bought back. Of the five that sold, one brought as much as it did as a yearling, three sold for minor profits, and one was a home run. The home run was a filly by War Front out of Kokena that Dennis O’Neill bought for $310,000. The filly had been purchased by Bruno DeBerdt for $100,000 out of the Keeneland September yearling sale. Overall, though, Barretts March got the select season started right with the average price rising 8.7% and the median jumping 21.4%. The California sales company made a good call to take the lead-off spot when Fasig-Tipton moved its Florida sale to the last week in March and was rewarded with positive metrics even though it offered 40% more horses. The only concerning statistic coming out of the Barretts sale was the buy-back rate of 36.4%. Granted several horses were purchased privately back in the barns after the sale, but the rise in the buy-back rate is a reminder that buyers continue to be selective. If consignors don’t want horses coming home, they need to be realistic on their reserves. A couple of six-figure buy-backs were head scratchers. An Empire Maker colt bought as a yearling for $30,000 was a buy-back at $245,000. That seemed like a pretty good margin, and it’s hard to imagine someone didn’t negotiate a private purchase later. The average price for the Barretts sale was a good $109,429. 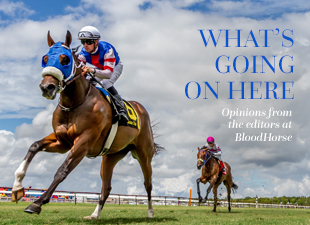 As we roll on through the OBS March sale (March 13-14), the Fasig-Tipton Florida (March 26), and the Keeneland April sale (April 9), let’s hope to see buy-back rates come down a bit and horses get shipped to trainers. Nothing wrong if at the end of the select season the ROR has only ratcheted up a couple of points to 75-77%. Wise horsemen have stated it with regularity as the industry has passed through its cycles: no one ever went broke selling his horses for a profit.